In the unique way that serial fiction works, I praised the previous volume of Red Hood and the Outlaws for telling a bold, risk-taking Starfire story, and then Red Hood and the Outlaws Vol. 7: Last Call reverses or mitigates those very risks. Had Vols. 6 and 7 been collected together, I might not have been so effusive in my praise, demonstrating that it's even the sometimes-arbitrary dividing lines between books that can make or break them. I figured that given that Scott Lobdell takes up this series again with Red Hood/Arsenal almost immediately, this book would flow naturally into the next. Instead, Last Call starts strongly but ends very rushed, which might explain in part the quick wrap up of Starfire's storyline. This is not unfortunately the best this title has been, which is shame after Vol. 6's strong showing. At the end of Vol. 6: Lost and Found, I thought it was gutsy of Scott Lobdell, and fairly realistic, to reveal that Starfire Koriand'r had been a drug addict while enslaved, and to have her turn to drugs again when confronted with trauma from her past. This had special resonance in the book as a whole given that Red Hood Jason Todd's mother died from drugs and that Arsenal Roy Harper is a recovering alcoholic (and indeed Roy and Kori have a pseudo "My ward is a junkie!" conversation in these pages as well). But by the end of Last Call we understand that Kori only took the drugs (at home, in shooting galleries) to try to get to the head of the drug syndicate, not because she's addicted. I suspect this was not Lobdell's original plan and became necessary only because Starfire departs this title in the end to headline her own more lighthearted "DC You" series next. For one, Starfire's plan is pretty much nonsense; for another, Lobdell suggests in the end that Jason and Roy were in on Kori's scheme all along, which doesn't hold up for a couple reasons including that they're trying to track her down. Third, Kori's burning Roy almost to death is tragic when it seems a drug-addled mistake but almost ridiculously negligent when it turns out Kori's gone down this path with intention. The early issues of this collection are most assuredly the stronger ones, including the first issue where Jason sits by Roy's hospital bedside and recounts how Roy's injuries came about. I didn't really believe those injuries would last given Roy's presence in Red Hood/Arsenal -- and indeed they're magically healed in the second chapter -- but Lobdell writes a moving vigil chapter. I was never concerned Lobdell's series would be lessened writing two of these characters instead of three, but Lobdell seals here Jason's affection for Roy -- less well established than Roy's for Jason -- and that's a fine basis on which to drive the Red Hood/Arsenal series to come. The book's best issue is its third (issue #37), which some four years into the New 52 finally lays out for good what went down between Green Arrow and Arsenal. There's no great revelations here, but Lobdell reinforces what Jason states earlier in the book, that Roy is "Batman-brilliant" but hides it under his "goofball" exterior. That's different, to be sure, from the pre-Flashpoint Arsenal, but it's an engaging set-up for this Arsenal and I'd still argue Lobdell has written this difficult character well throughout this book. What stands out to me in this issue is how absurdly desperate Lobdell makes Roy out to be, imagining a friendship with Oliver Queen where none exists and then getting jealous when Oliver doesn't involve him in matters that aren't his concern. Roy is dramatically in the wrong here, and I applaud Lobdell for an Arsenal origin that focuses on his problems without trying to redeem him. As it concludes, however, Last Call tries to tackle a bunch of ideas that ultimately just peter out (the transition in the book is indicated in part by the change from artist RB Silva to Tom Derenick). Red Hood faces a potential drug addiction of his own to Bane's Venom, but then simply turns away from it without much consequence. Deathstroke's daughter Rose Wilson nee Ravager appears out of nowhere and the audience only gets the barest hint that she and Jason know one another (if this happened in another title, I haven't found it yet). There's actually a nice suggestion of larger Outlaws team for a moment, with Red Hood, Arsenal, Starfire, Ravager, and their enemy-turned-ally Crux, though the group goes their separate ways in the end. I like Lobdell's looney Crux quite a bit, but the space of the whole issue devoted to him might've better been used, at least in part, on the book's final confrontation with Wildstorm's Lord Helspont. As I've said before, I give Lobdell credit for beating the drum of the New 52's Daemonite storyline long after everyone else gave it up, but Helspont comes off in the end as a generic alien conqueror instead of Lobdell bringing to a real climax Helspont's years of appearances across numerous titles. Red Hood and the Outlaws Vol. 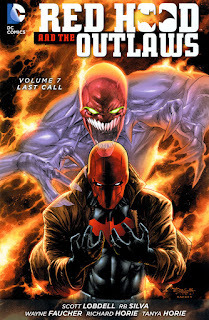 7: Last Call ends with a Futures End tie-in issue that pits a fugitive Red Hood against Arsenal, with art by Scott Kolins. Lobdell's story reads a tad quick (and doesn't, don't get me started, tie in to Futures End at all), but it's an interesting coda to the regular series' hug-filled ending; I'll be curious to see if it's an indication of the direction Red Hood/Arsenal will take. Even as Last Call doesn't deliver on the promise of Lost and Found before it, the connections between the characters continue to drive this series, and my high hopes still remain for what comes next.